The Girl Scout cookie favorite made into a healthy bar with only 6 ingredients and ready in under an hour. 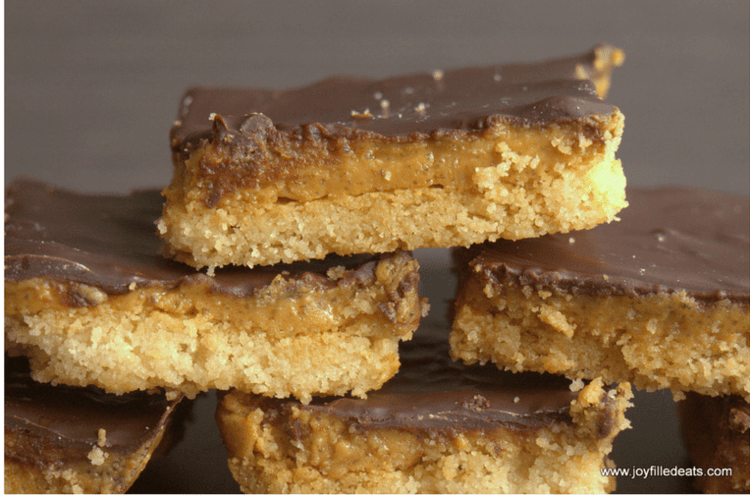 My Tagalong Peanut Butter Cookie Bars will help you resist cookie sale temptation. Ever since I ate the last Tagalong Cookie from my freezer stash last month I’ve been wanting to make more. But they were a little time-consuming… I’ll admit it. Making the dough, rolling it, cutting out circles, baking the circles, making the peanut butter, freezing the peanut butter, and then assembling all the parts and coating them with chocolate. Time-consuming. But delicious. I knew I needed an easier method. There is just something about Girl Scout cookies. I’m not sure if it’s nostalgia or just the fact that they are only sold a couple times a year but when I see them I want them. Samoas, Tagalongs, Thin Mints, Trefoils. Bring em on. My goal is to make healthy versions of all of them. The flavors of these bars are the exact same as the cookies but they are so much easier with a press in cookie crust and just 6 ingredients. And they don’t have any special ingredients except the sweetener. 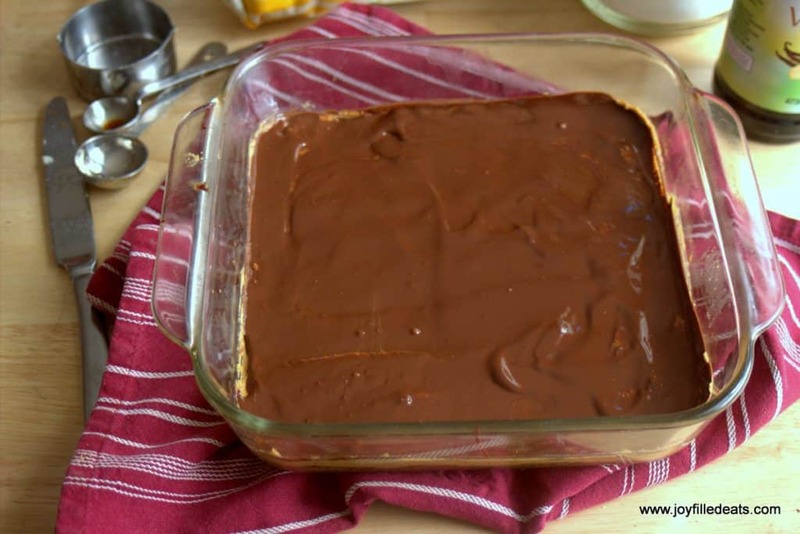 To make these chocolate covered peanut butter cookie bars first you stir together the crust ingredients, press them into a baking dish, and bake. While the crust is baking mix the peanut butter ingredients in the same bowl. No washing required. Gently spread that on the warm crust. Melt the chocolate, drizzle on, spread. Cool and eat! 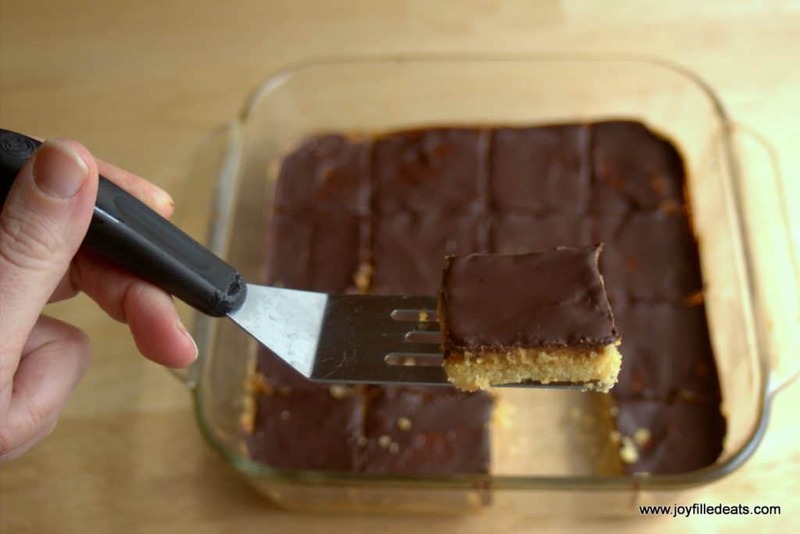 I hope you enjoy these Healthy Chocolate Covered Peanut Butter Cookie Bars! 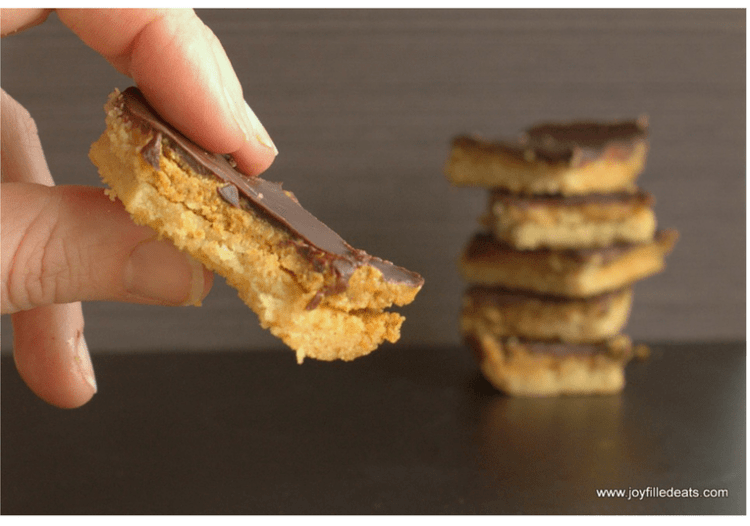 Tagalong Cookies simplified to just 6 ingredients & ready in an hour! These chocolate peanut butter cookie bars taste like your favorite Girl Scout treat! Keto, Low Carb, THM, Grain-Free, Sugar-Free & Gluten-Free. 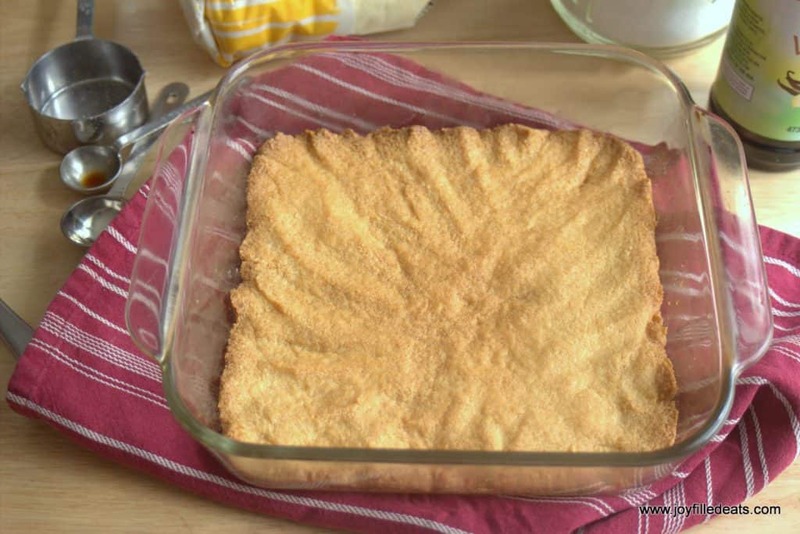 In a medium bowl mix all the shortbread ingredients until combined. 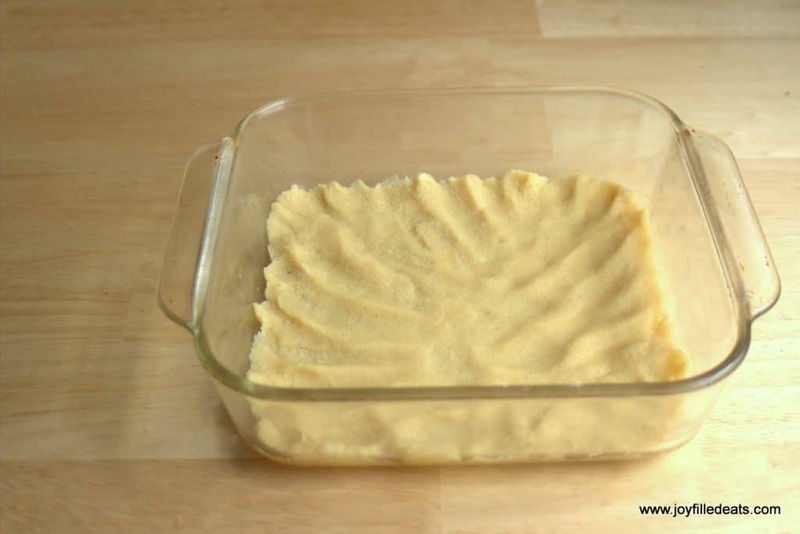 Press into the bottom of a square 8x8 baking dish. Meanwhile, combine the peanut butter ingredients. If your peanut butter is cold you can microwave it for 30 seconds to soften it. When the shortbread comes out of the oven drop little blobs of the peanut on top of it. Spread gently with a spatula. The heat from the cookie will help spread the peanut butter. Be gentle or the bottom layer can crumble. Melt the chocolate in the microwave or double boiler. Pour over the peanut butter. Spread gently. Put in the refrigerator until firm. Cut into squares and enjoy! Unfortunately, my crust didn't stay together - when I cut the slices the peanut butter and chocolate layers lifted off leaving nothing but crumbs behind. Maybe it needs more butter? In any case, if I try it again I'd use sugar-free chocolate as the 85% cocoa version tasted bitter like baking chocolate. Plus it has more carbs - some brands have a lot more! You may have baked the crust too long. Or your oven temp may be too hot. That can cause it to be dry. And you may absolutely use sugar free chocolate. It is more expensive so I use 85% when I can. I just made these for the first time and they are so delicious! They definitely satisfy that chocolate/pb craving. I used 1 1/2 T Pyure for my sweetener and baked in my silicone bars mold. (my 8x8 pan got ruined) All this to say - perfect dessert! Thank you! Quick little question. Do these need to stay refrigerated? They should be fine at room temp for a few days. I store all my low carb baked goods in the fridge just to be safe. I usually refrigerate all my THM/low carb goodies too. I plan on making some to take on vacation this summer so good to know these can be out a day or so. Thanks Taryn! 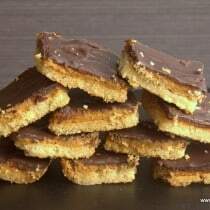 I just made these for the first time, and while they taste good, the crust separated from the peanut butter layer. I used a fresh ground PB (nothing in it but peanuts). Any idea why it would stick? So bummed. I'm not sure why that would happen. I wonder if the fresh ground peanuts have more oil than the jarred stuff. You could try a little extra melted chocolate in between the crust and peanut butter as glue. I was hoping to try to make this today!The only peanut butter in my area, w/o waiting for an order is Jif Natural Peanut butter or Justin’s Natural Peanut Butter. Is it ok to use either of those? I will eventually put in an order for the Smuckers on Amazon but I wanted to make these today. :) Thanks! Any peanut butter will work. It's just preferable to use one without added sugar. These were AMAZING!!! So so good, the first time my husband has asked me to please repeat a THM dessert recipe. I also appreciate that these are THM while also being grain free. I'm also off dairy so I subbed coconut oil in for the butter. Worked perfectly. I tried dropping the peanut butter mixture into small blobs on the very hot cookie crust, but it didn't melt enough for it to be spreadable so I scooped all the PB blobs off into bowl and added a tablespoon or 2 of warm coconut oil to thin it out. Worked great, and made the PB mixture perfectly spreadable. I also doubled the recipe into a 9x13 glass pan, worked great and the cookies came out of the pan without any sticking whatsoever (which I was worried about). Thank you for such an incredible recipe! Hello! 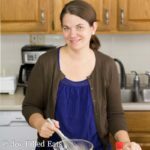 I suspect I have an erythritol allergy and wondered if I could use just xylitol in this recipe? I have made these twice and LOVE them! I am having an issue with the crust sticking to the pan after I cut and try to serve. I am chilling it all before cutting/eating. Any suggestions? And P.S, Thanks - so YUUUUUM! You could line your pan with parchment paper so it releases easier. Glad you like them!! The peanut butter never melted, just crumbled & it never stuck to the cookie crust. Trying to put chocolate on that later on was a disaster. This was an expensive kitchen fail for me. The flavor wasn't there either. Hmmm. I wonder if it was the type of peanut butter. Were you using a natural peanut butter without added ingredients? I've had many, many people make this recipe and this is first negative review I've had. What type of chocolate did you use? This is how mine turned out too. Me too. I did another batch last night but with powdered swerve in the pb and mixed the melted chocolate with the pb, like an oh Henrybar recipe, and that was a lot easier to spread. . Granulated sweetener in my origibpnal batch made the pb gritty. I made these and they were so good. My daughter said they were even better than the girl scout cookies. The only problem is that mine wouldn't come out of the pan. The bottom crumbled. Still ate them. Any suggestions? I'm glad you liked them 😀 Did you chill them before removing them? Can't wait to try this! 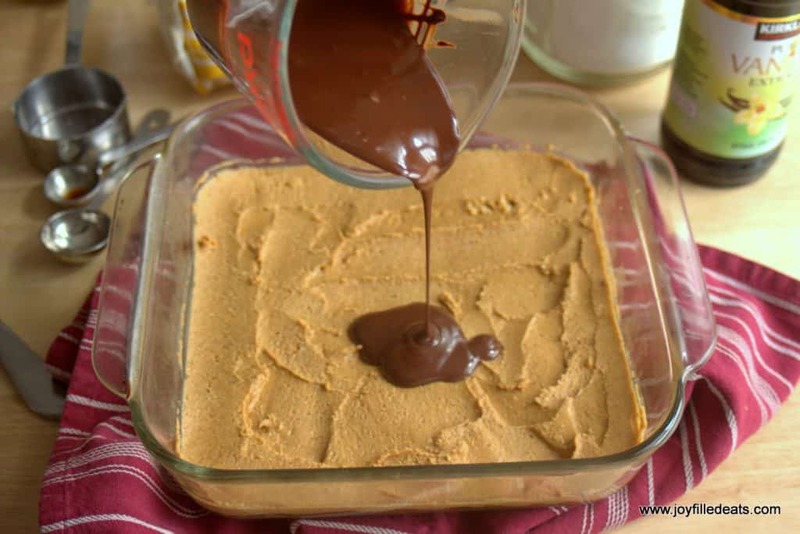 Did you use an all natural or low sugar peanut butter for this recipe? I used Smuckers Natural. Any peanut butter that is just peanuts and salt is good! These are amazing! My favorite Girl Scout cookie in a guilt-free version! A total win in my book! I needed these in my life! Love the peanut butter and chocolate combination! OMG, you just totally made my day. I have been craving something sweet this week and I didn't want to resort to sugar-free candy. I'm making these this weekend! What is 3 T, is it tablespoons? Yes, a capital T is an abbreviation for tablespoons. A lowercase t is teaspoons. Do you think one could double this for a 9*13 pan? Wondering if you have tried these with THM baking blend since it is less calorie dense than just plain almond flour? I have not. I typically eat grain free but you should be able to sub it in. I am a little confused. I thought the THM baking blend was grain free. It is gluten free. It has oat fiber which is a grain. If you can't have xylitol what other thm sugar would you recommend and amounts? Do you have a suggestion for making these without a blended sweetner? I prefer to bake with Swerve. Thanks! Swerve should sub in fine in this recipe. It is not as sweet as the blend I use though. You may need up to twice as much. We did not use any sweetener and they worked out well. However, the base crumbled. We did refrigerate them before we cut them. How much chocolate chips would you recommend using? Not so patiently waiting for these to firm up in the fridge! Can't wait to try them! Fairly easy except I could NOT spread the PB mixture for the life of me! Ended up scooping it off & remixing with a tbsp Louanna brand coconut oil. Then it worked perfectly! My peanut butter seized up once I put the Gentle Sweet in. Is there a reason for that and is there any way to not make it do that? Thanks for the great recipe! You can add a little coconut oil to thin it again. I've made these a few times and each time gets better. When it comes to spreading the layers I like to use a butter knife (the kinds that have the handle that raises up). I might even slick it down with a little coconut oil first. Works well. Omg! These are so good!!!!! I made them with chunky on though, cause I can't stand smooth on, so I made it harder on myself. But so yummmyyy!!!! In my older recipes I used T. for tablespoon and t. for teaspoon. Then I realized tbsp and tsp were the more commonly used abbreviations. I haven't had a chance to edit the oldest recipes yet. Capital T is tablespoon. Do u think THM Baking blend would work in place of almond flour? If so how much should I sub? Can't wait to try these! Oh.my.word. I never comment on recipes and products, but....wow! Easy and so delicious!! I'm blown away and will feel so guilty eating these even though I shouldn't ;). Bless you for coming up with this gem ? If you are allergic to almonds do you think coconut flour would work as a substitute? Just coconut flour would be too dry. You could try a blend of coconut flour and ground golden flax. Or you could use peanut flour. 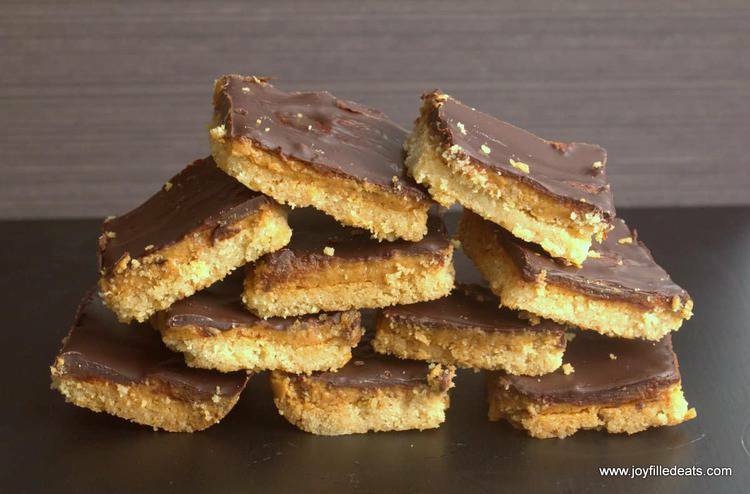 I made these and the taste was good, however when I went to spread the peanut butter onto the shortcake it didn't spread well causing the shortcake to lift off the pan. So I mixed those two together and squished it into muffin tins and then topped that with the chocolate. When I do it again I will just do the three layers in the muffin tins and once the are cool lift then out. Hi Melanie. It is a little tricky to spread the peanut butter. It helped to put small blobs all over so I only had to spread a little bit. I think it would work to freeze the shortbread first too.